Coconut Chutney is a Popular Chutney Recipe in South India. It Pairs with idli's,Dosa's,Pongal, Uttapam,Paniyaram's,Upma's,Rava Dosa,Medu Vada, Bonda & adai. It is an all Purpose Chutney. you can make lots of variations with this chutney. 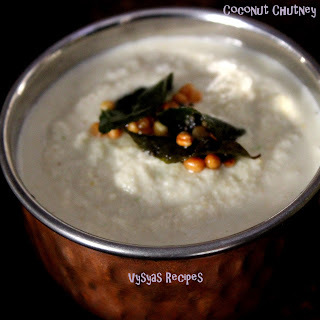 No idli's,dosa's or Pongal are served in hotels without Coconut Chutney.Coconut Chutney is a king or Queen of all Chutneys.Freshly Grated coconut ground with fried dal, tempered with curry leaves is a Wonderful accompaniment for Indian Dosa's & idli's. From elders to youngers everyone likes this chutney. This chutney could also be made very quickly at our busy mornings. Now we learn to make the chutney. Freshly Grated Coconut - 1/2 cup. Fried Gram - 2 tbsp. Green Chillies - 2 - 3. Grind Grated Coconut, along with fried gram,Green chillies,Tamarind,salt with needed water into smooth Chutney. Heat the oil add mustard seeds when it splutters add urad dal,Curry leaves, & when dal's turns Golden brown colour, Pour over the chutney. Now Coconut chutney is Ready to serve. Always use freshly Grated coconut for best Results. if the chutney is little bit runny, adjust with coconut or fried Gram. Always add water little by little to make Chutney. Adding a tsp of urad dal gives nice crunchy taste to chutney. Adding curry leaves gives nice flavour to chutney. Always use less quantity of Fried Gram than Coconut Gratings. you can make lots of variations to this chutney. Add 1/2 inch Ginger while Grinding. Add 1 tbsp of peanuts while Grinding. Add 1 sprig Curry leaves while Grinding. Add 2 tbsp chopped coriander leaves while Grinding. Add one shallot while Grinding. Add Red chillies instead of Green chillies while Grinding for Red colour. Add Equal number of Red chillies & Green chillies While Grinding for spiciness. Add a Garlic flake while Grinding. Temper with a Red chillies. Gayathri eppadi irukkeenga? thengai chutney arumai. Coconut chutney looks super yummy, Gayathri! 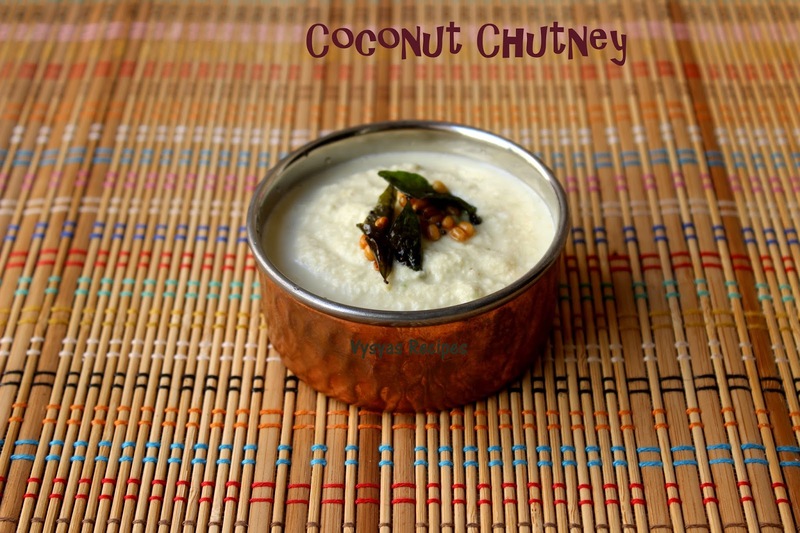 Nice ingredients you have used in this coconut chutney.